The Beoplay E8 is a tiny yet impressive piece of audio tech. While the four-hour battery life can be a bit frustrating for all-day users, it’s certainly not something we’d hold against the E8. The touch controls are responsive, and we just can’t get over how gorgeous these things look. Yes, you’re going to be paying a higher price, but for this kind of premium finish and audio quality, it almost seems worth it. Let's not pretend here, the B&O Beoplay E8 are probably the best-looking and most expensive wireless earphones on the market that you can buy right now. Sure there are plenty of cheaper options, and plenty of more expensive ones. You can throw in a bit more money and splurge for one of our favorite headsets, the Bose QuietComfort 35, which will give you better battery life and a richer sound. But if you’re looking for a something smaller, stylish and have cash to burn on your next pair of buds, then the Beoplay E8 are your best option. Before getting to the earphones themselves, we have to appreciate how B&O have designed the compact carry case. A gorgeous clamshell-designed leather rechargeable leather case provides plenty of protection for your E8s, while simultaneously keeping them charged at all times. The Beoplay E8 will give you about four hours of playback on a single charge, while the case holds an additional two charges, so you’ll get close to twelve hours of total playback time. On a fully depleted battery, the case will take about two hours to full recharge the E8s, or you can pop them in for about twenty minutes to get roughly an hour’s worth of playback. The case firmly holds the E8 in place during charging, and even a few test drops on the floor didn’t cause the case to spring open, which is a great plus point. The earphones themselves clearly exude B&O’s design details, with no physical buttons in sight. Instead, the touch-sensitive pads on each bud give you all the control you need through a series of taps. It takes a little getting used to, and you have to remember how many taps you require for a particular action to trigger, but it’s something that easy to learn after regular use. For example, you can tap and hold on either earpiece to control the volume, or tap on the right to pause a song. Tap three times to invoke Siri or Google Now, or tap once on the left earpiece to enter Transparency mode (more on that later). You get used to not having to fumble around for buttons, but the one thing worth noting is that because the Beoplay E8 sits so far into your ear canal, frequent taps can start to really annoy you as it feels like you’re pushing them further into your ear (even with light taps). In the box you’ve got a microUSB cord for recharging the case, as well as a selection of interchangeable eartips for the best fit. There’s also one pair of foam tips, which we found to be the most comfortable for our ears, so it’s strongly suggested that you try them out to see which ones work best. 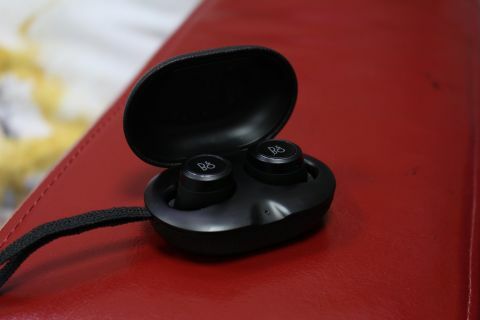 The Beoplay E8 pairs via Bluetooth, but what B&O are saying makes the E8 different is the fact that the earphones communicate with each other on a separate NFMI technology (the same used in hearing aids) to maintain a consistent connection with each other. This was done to reduce audio dropout, which is fairly common with these kind of Bluetooth earphones. One you remove the earphones from their case, you simply hold down both touch surfaces to put the Beoplay E8 into pairing mode, and then just select them from your device. Out of the box the Beoplay E8 offers excellent audio quality, but we would recommend that you download the Beoplay app to further tweak the E8. The app allows you to update the E8’s firmware, but also gives you access to two specific features. The first is ToneTouch, which functions like a visual equalizer. You drag a dot around four areas – warm, excited, relaxed, and bright, and the audio experience changes accordingly. You can pinch to increase the size of the dot, which then changes the effect on the audio. Presets are also available to quickly adjust things, and we found that overall this was a much more friendlier way to tweak your audio than fiddling around with a standard equalizer setup. The second feature you’ll get access to via the app is Transparency. This nifty feature on the BeoPlay E8 allows you to quickly tap on your left earpiece to allow outside audio to be heard. The E8 provides a decent amount of noise isolation because of their snug fit, so this is a quick and easy way to hear something from your environment or if someone is talking to you, without having to take an earpiece out. There are three Transparency modes you can choose from: ambient, social, and commuting, and you can toggle between them via the app. We found ‘social’ to be the best for when we were listening to music in the office – we could quickly tap to hear what a coworker was saying, and then tap again to resume normal music volume. Wearing earphones for a prolonged period of time can be a bit uncomfortable, and while the BeoPlay E8 is quite lightweight, it feels slightly bigger when placed in your ear, and they do tend to protrude out just a little bit more. We found that our ears were ever so slightly more sensitive after wearing the E8s with the normal ear tips, but when we switched the foam ones, we could wear the E8s for much longer with zero discomfort. They also didn’t feel like they would fall out at any time, and since they’re dust and splash resistant, you could wear these while jogging or doing a quick workout in the gym. Despite how small these earphones are, the audio quality was actually really good. Even without tinkering around with ToneTouch, the E8 sounds crisp and clear. Bass feedback will depend on how snug you’re wearing the E8s, but was acceptable for earphones of this size. Things were much improved when using the ‘warm’ preset, while orchestral pieces sounded much crisper with ToneTouch turned off. Vocals really came through when we mixed both ‘relaxed’ and ‘bright’ modes, so we’d recommend making a few presets of your own if you really want certain types of music to shine through. When paired with your smartphone, you can also use the E8 for phone calls. Voice clarity is very good, and though extremely windy environments will introduce a slight bit of noise, that’s entirely forgivable. If you’re able to look past the price point, then then Beoplay E8 is a great investment. It’s super compact, offers great audio, and looks great - what more could you ask for?